Quite some time ago now, gcrl sent a stack of Indians cards to the Tribecards household. 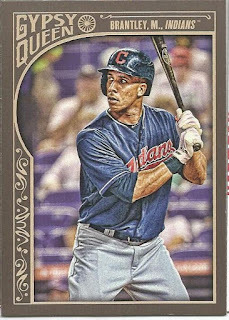 I am just now posting those (and, Bo, a post about your box of Indians is coming soon) as a part of my "catch the freak up, man" marathon. The stack starts with Corey Kluber, then travels through a interesting set of twists and turns in terms of collecting. Yan Gomes looks up and to the left, evidently watching for the ball that he hit straight up into the air. 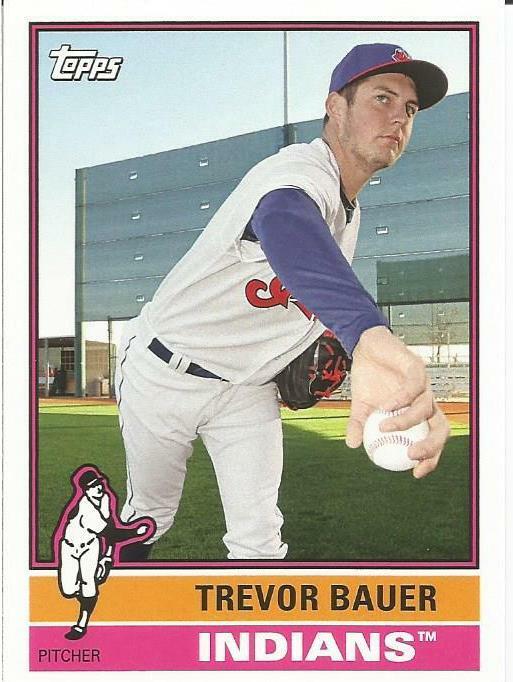 Trevor Bauer winds up, here's the thr... He does know he is supposed to let go, right? Next up is Doug Jones in all his 80's hair and 'stache greatness. I'm just glad there's no fire. 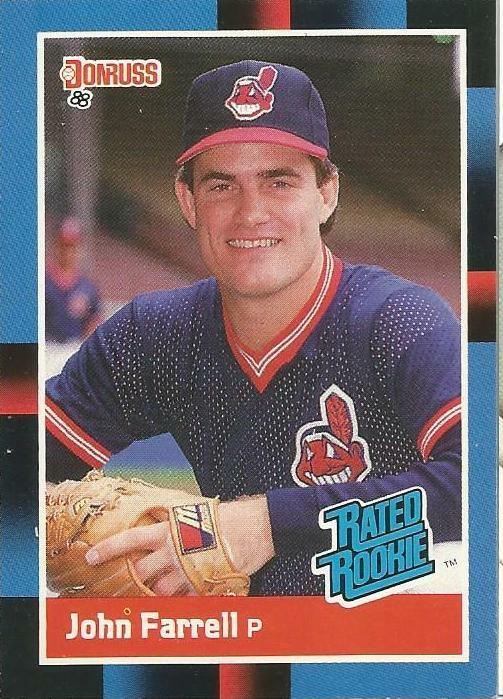 John Farrell is looking rather Happy in his Rated Rookie pose. 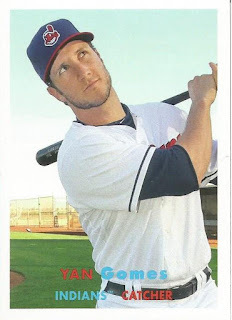 Yan Gomes again looking up to his left. I see a pattern here. 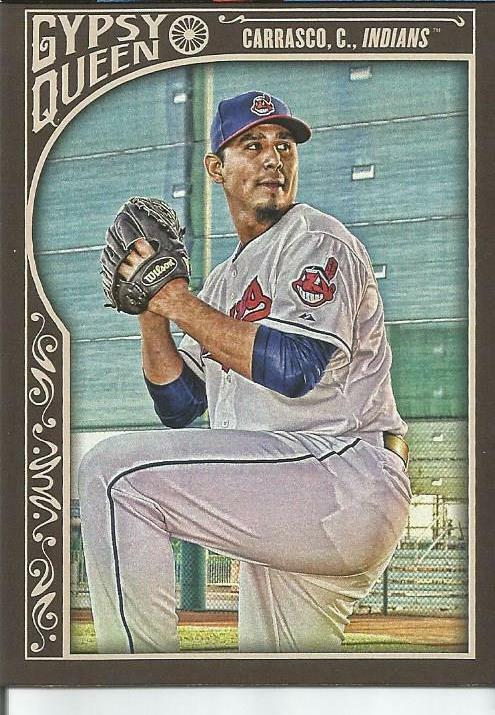 Carlos Carrasco appears to be indoors or in the bullpen or... I'm not sure. Michael Brantley is NOT messing around here, people. 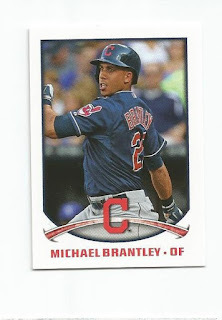 Here is what Brantley looks like after the previous card! Doc Edwards. 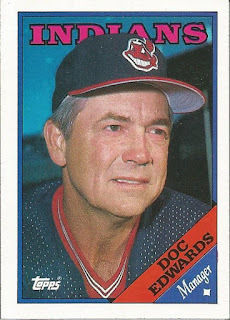 I'm afraid the good doctor couldn't save the Indians of the 80's. 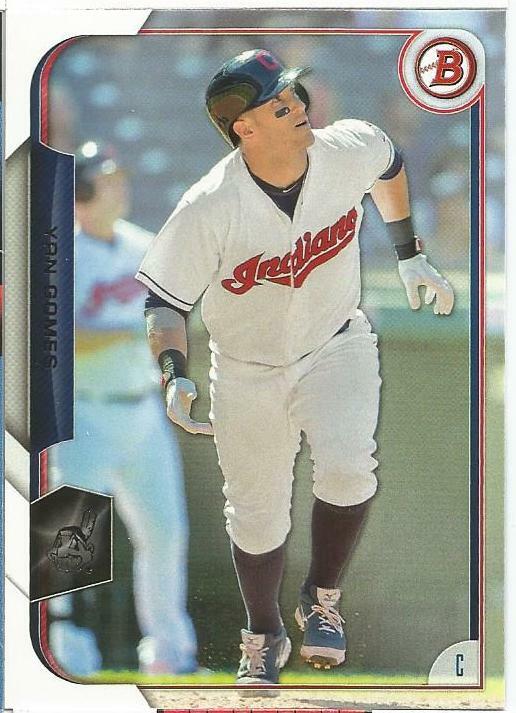 Joe Wendle looks like he is ready to take off. 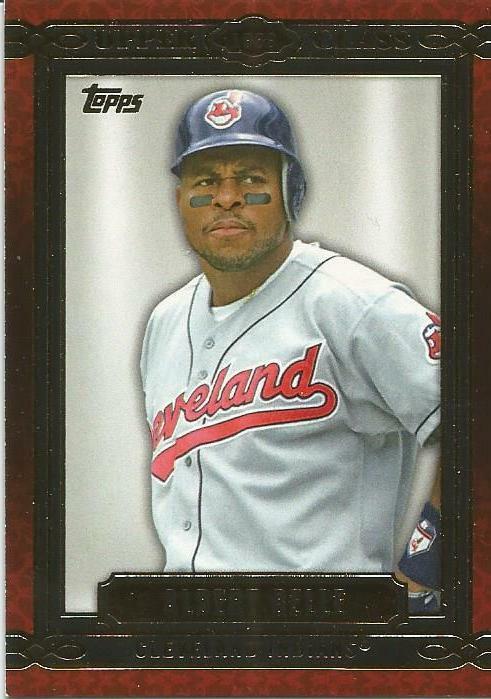 Albert Belle, on the other hand, looks like he is about to take off... someone's head. 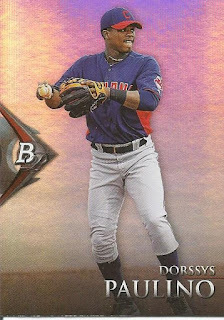 Dorssys Paulino finds himself on a VERY shiny, rainbowy card. 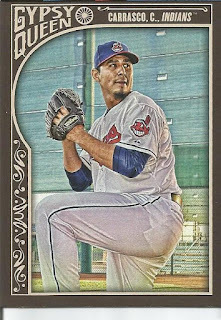 Juan Lara also finds himself on a shiny, rainbowy card. He doesn't look too happy about it though. 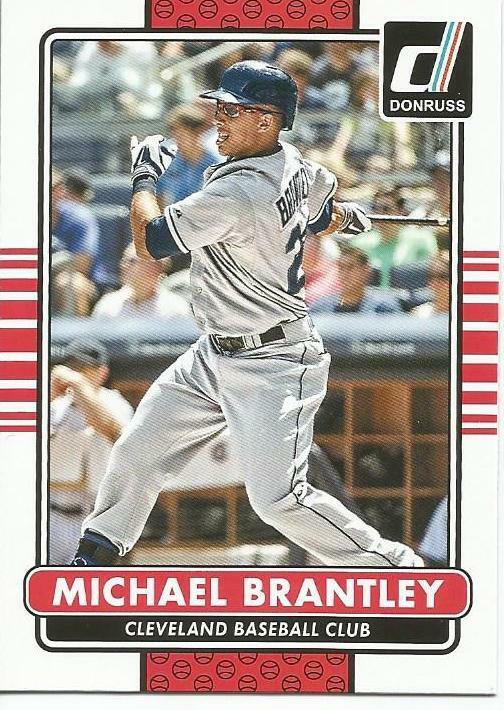 Brantley returns a bit smaller after a big swing. 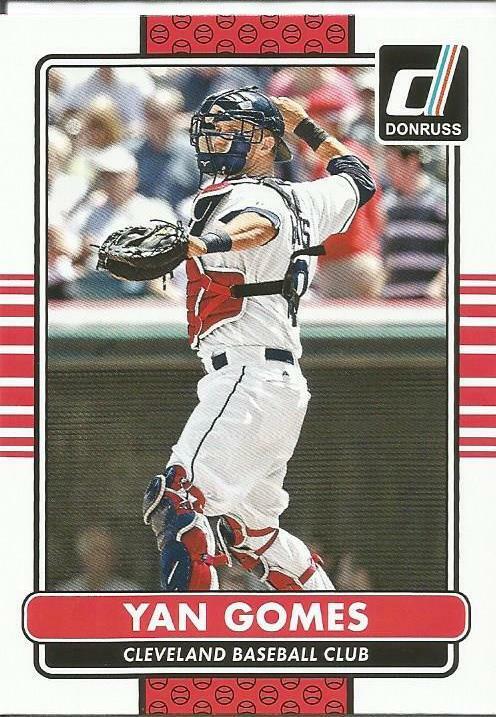 Gomes dons his catcher's garb for this one. The women of Dinged Corners would be proud. 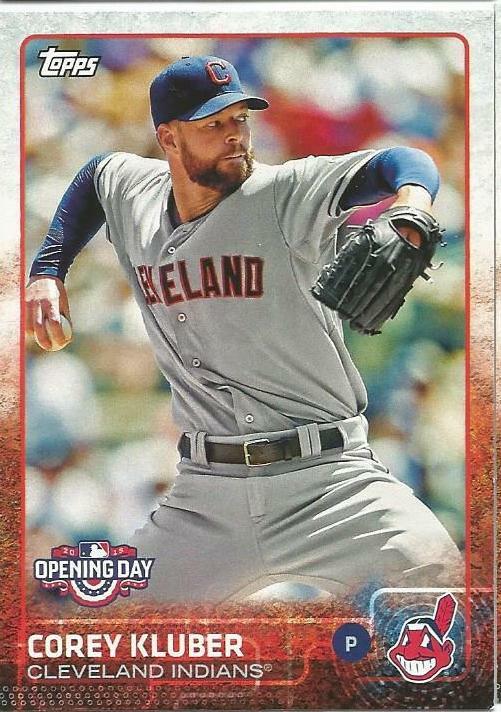 Kluber comes back for Opening Day. 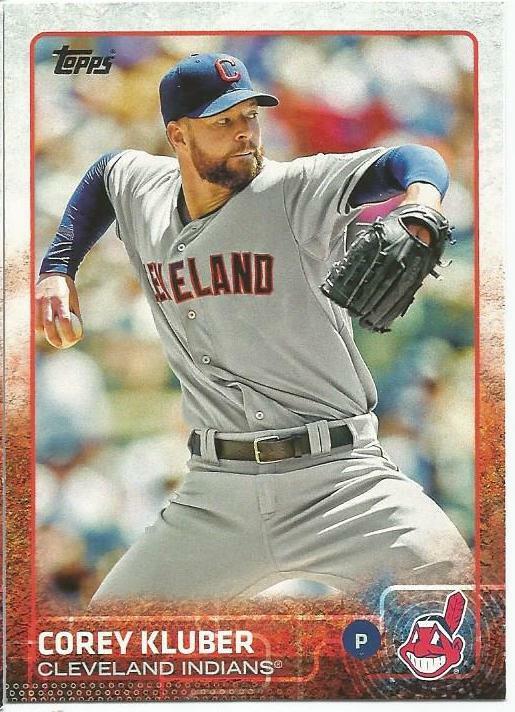 And then Kluber refuses to leave the mound, ending the pack he started. THANK YOU very much, gcrl for these great Indians cards!! 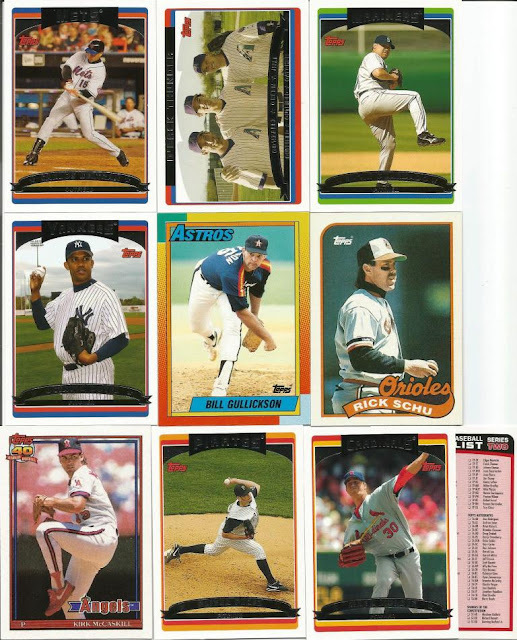 I don't know if you enjoyed looking through these as much as I did writing about them ,but I had fun - and that's what matters in this goofy hobby we all love. Hello, everyone! Thanks for dropping by to see what we've got today in the world of the PAD Circus. 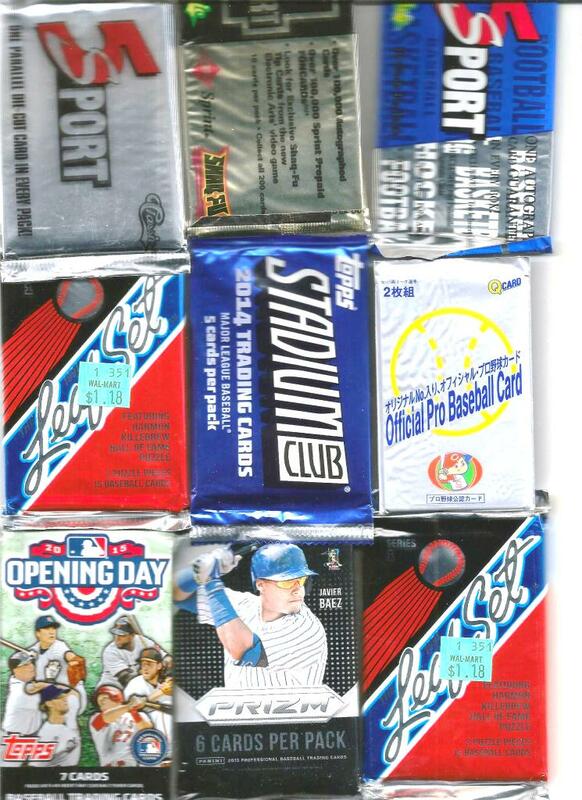 First up: Normally, we run pack opening through the end of the regular baseball season. 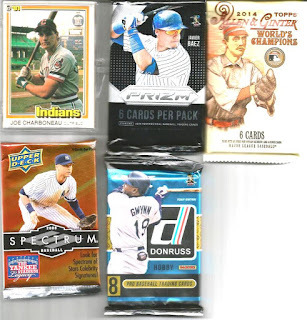 This season, we have SO MANY packs, many donated by you players and readers, that I see the PAD Circus running through playoffs - heck maybe even to the World Series. Basically, I'm not going to quit busting packs until they are all busted. But, if it turns out we have a supply that lasts to the World Series, I will probably bust open everything in a "last draft effort" before the series. Next up: I hope to have PAD 2014 ready to ship by the end of this coming weekend! I'll be on a sorting and packing binge during the week. Those of you that have taken part in last year's and this year's should also get some of this year's cards as well. I'm going all out, balls to the fence, this week to get this done. You've patiently waited far too long. Finally: The OOTP game has been on hold for much longer than I wanted. The simple fact is that with the game's quirks (or operator error or whatever), things just got to be too much for me to clean up easily. So, after the actual MLB season, I am going to start a NEW game with the managers from 2015 that will run during the off season. You will have the players you drafted during the breaks and we will see who can take it all! Congrats to the Kazis for getting two players here today! Congratulations to the others of us who also add a card to our stacks. I have the black-and-white Carew puzzle from 1991 Studio in a frame on my wall. The version in this pack is the color version. Nice grab! Wahoo!! A Perfect Pack, folks!! That is AWESOME stuff right there. Congratulations, everyone that pulled players from this pack. I'm excited to have pulled a Choo, though he is Texas garb. 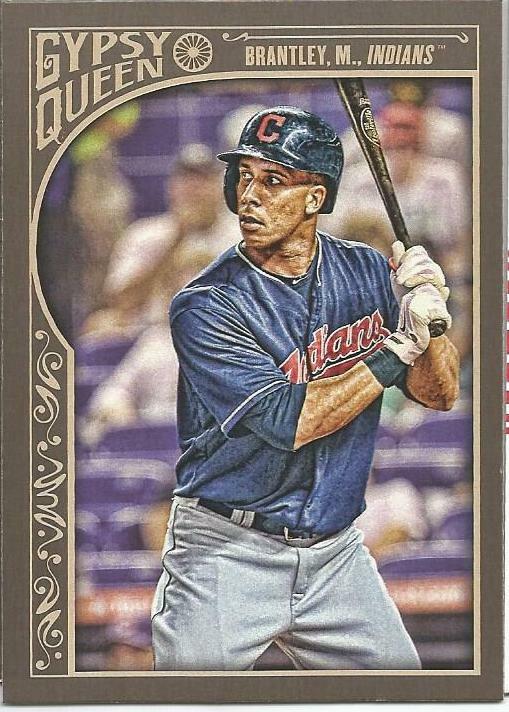 That actually works out because Play at the Plate and I are doing a little team swap: I am keeping his Indians and he will get my Rangers. It all works out! Wahoo!! #PackADailyCircus - Packs 190-191 - Packs from Jobu! Hello, everyone! In my various postings yesterday, I managed to NOT post a pack! UGH. 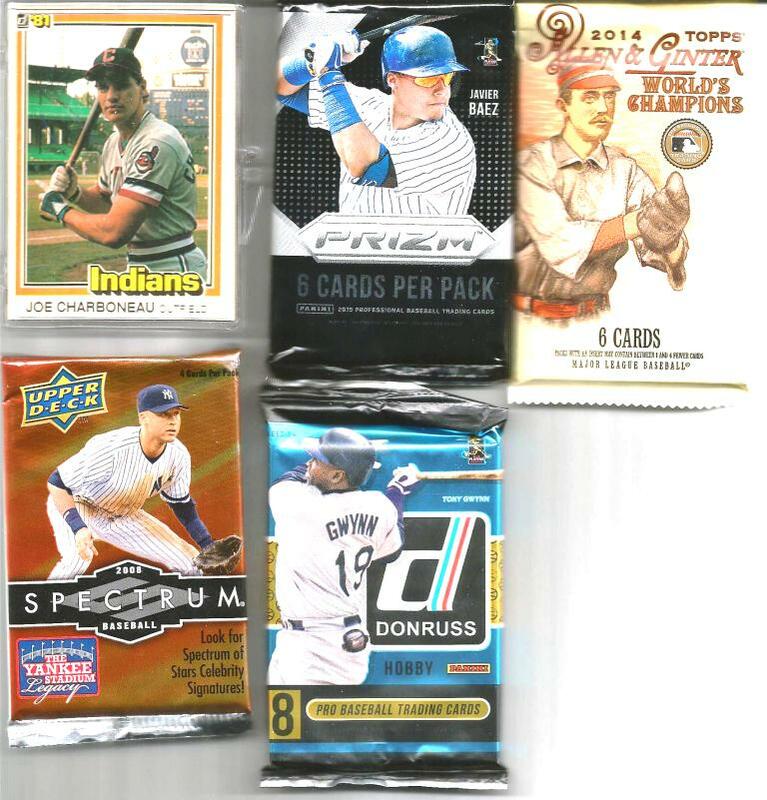 So, tonight, I am posting TWO packs. 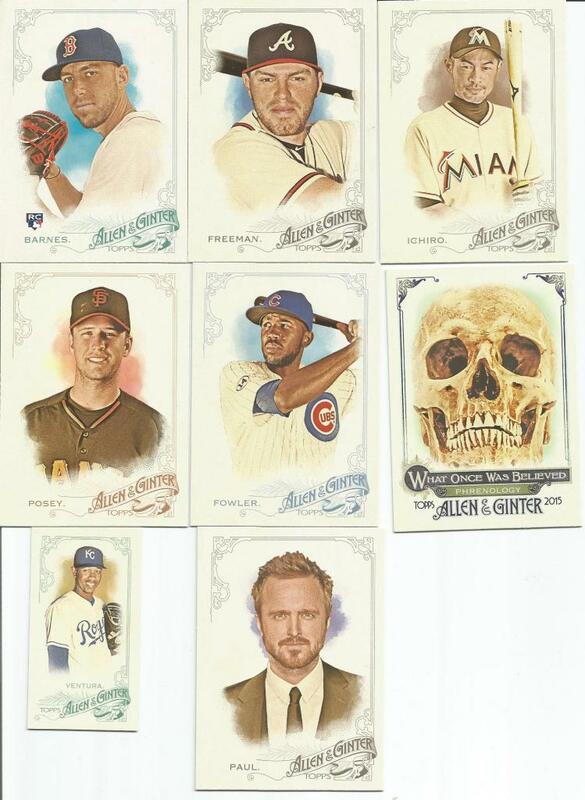 But, before we get there, I received a box in the mail today from Jacksonville Jobu. 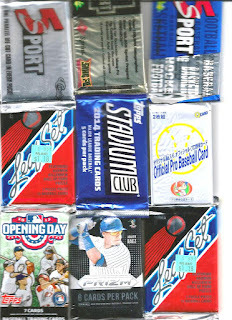 In it are all kinds of wax pack goodness!! THANK YOU Jacksonville Jobu!! We've got quite a mix here. So, tonight I am opening two of these. We're starting with the one that has all the Japanese writing on it! 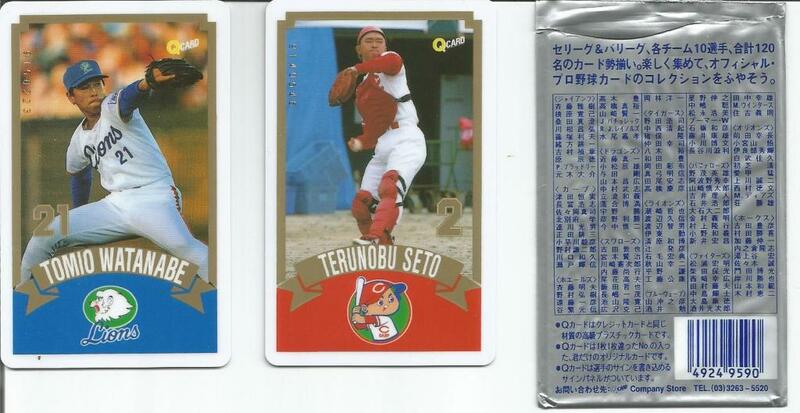 It says "Q-Card Official Pro Baseball Card." So, is there just one card in here? I dunno. The pack is also smaller than standard US packs, as you can tell from the scan above. Well, these are unique little cards. They are like credit card wannabes. Very interesting. Okay, well, these are a little different as well. 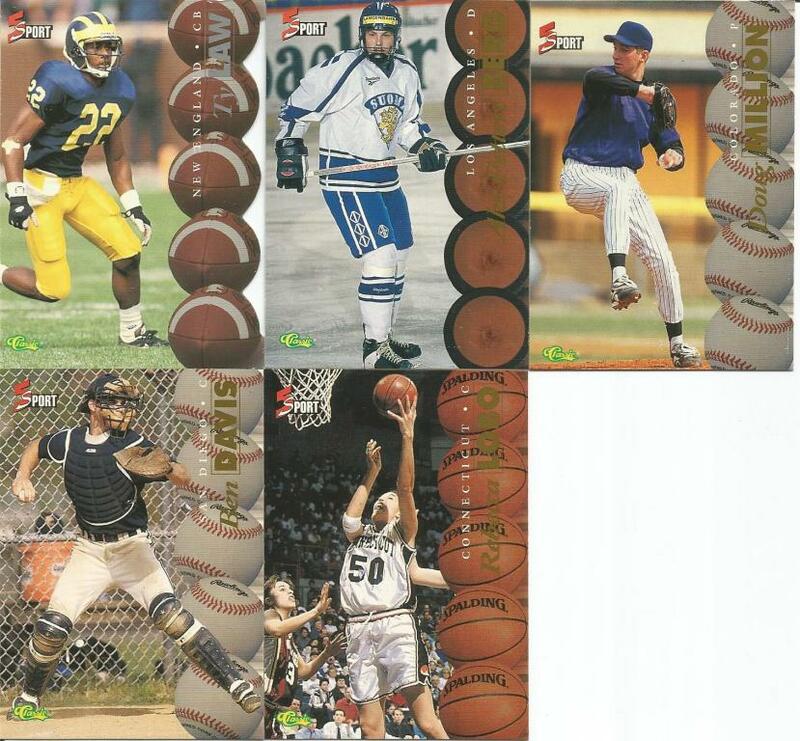 Here, we have a mix of sports. 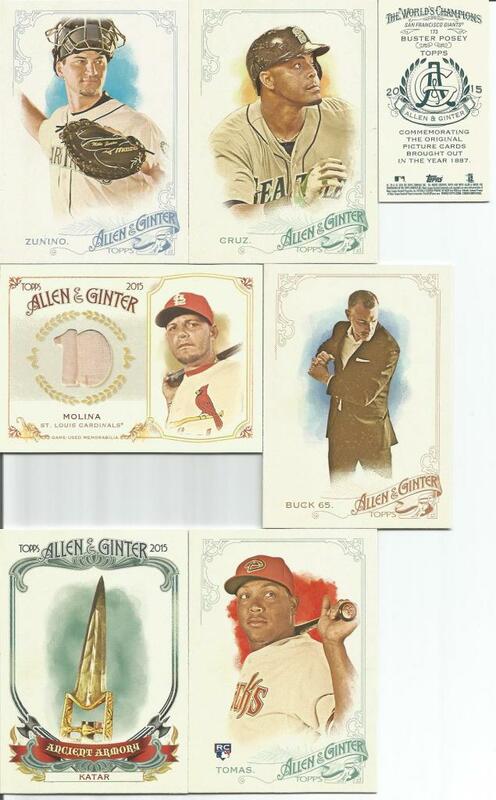 This was like opening some time warp version of Allen and Ginter. I'm scanning all the cards from tonight because I can't seem to find words. These are insanely wonderful bits of cardboard, well, and plastic. 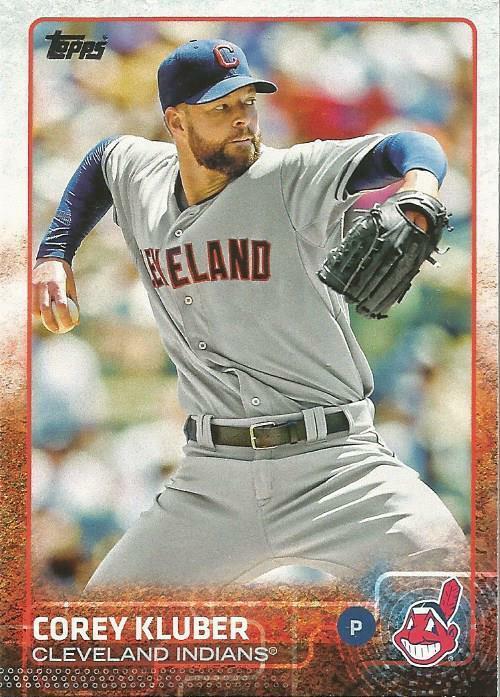 I did not realize that I had not actually written a review for OOTP 16 yet. One would think that would be something done very early on. Alas, I obviously tripped on my way out of the dugout there. This review is approached from two different directions. One is from the PAD Circus perspective and the other is an overall perspective based on my experience using a fully fictional league that will be used as the basis for a novel or novella. Overall: I really, really have grown to like the clean look of the interface. Some of the menus (or items on the menus) got moved a round a little, so that took some adjusting, but the interface itself is super clean and easy to read. The "Manager's Office" makes for a one-stop update shop: anything you need to know about what's going on in your league and/or with your team, it's there for you in plain view. 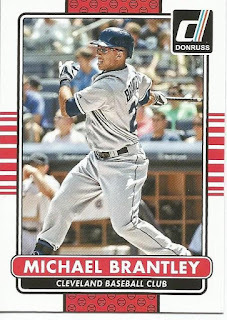 I think it is pretty cool that the game is now MLB licensed, though I don't use that feature (I am strictly a fictional-league person). I've watched a couple games with the new 3d field mode and wow, that is freaking cool! The folks at OOTP have really outdone themselves there. I would guess many people would buy the game for that feature alone! 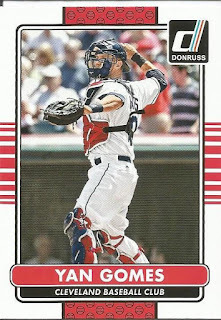 PAD Circus: I use OOTP to create a 40-team fictional league that uses the real players plus players I add along the way. The process is a bit convoluted because I have such a weird set of rules and circumstances, so I certainly can't blame the game for that. I do have an issue, though, where the game seemed to have taken over (I set everything for human manager - well, that *I* manage everything) from time to time. For example, I set the players on the teams and then suddenly, players are moved to other teams even though I set the NO TRADES flag and I am the human manager. I might have posted something about it on the forums, I may not have. Really, I am not convinced that I am doing everything correctly. It's one of those things - I question whether it is the game or my own head space. It is far too late in the real season and in the game's season to worry about it now. 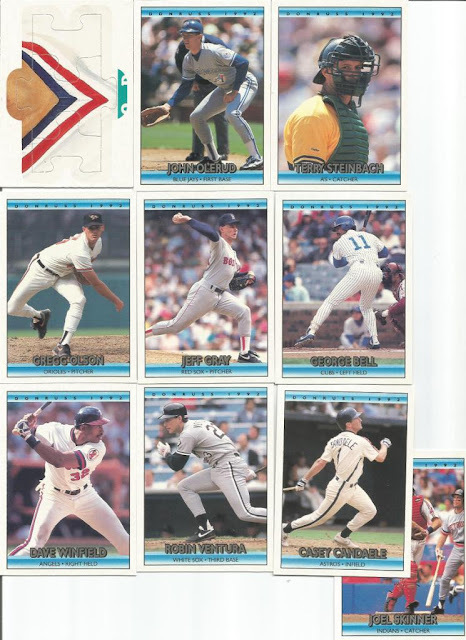 What it did mean, though, was that I have to manually add all the players back to my 40 teams. It has not been fun, and I have not really put a lot of time into it, which is not fair to the folks that are playing along "vicariously." My one wish, and I may post this as a request, is that game-generated fictional players should have some kind of FIC designation or something so that I know which players on any given team were imported from real rosters or were the result of filling a team with fictional players. NOVEL: I created a Midwestern league with 10 completely fictional teams and players. The game worked great as I watched the league and players start out from a first year entity to its current 26th season. In that league, everything was run by computer. I kept my hands off, except to change the city of one team, and let the game do its thing. I watched some of the simulated games, but mostly just blew through seasons a month at a time. At the end of each month, I'd check for injuries, news, records, etc. It was great watching rivalries spring up (even if those were made up in my head) and watch players as they matured in their play and eventually retired. My only real complaint is that players never die. I don't mean during the season, but after they are long retired. I really do wish OOTP would make that a select-able option - people could choose whether they wanted it or not. I would want it. I do love that you change certain settings during the course of things. For example, the HOF system I had set was a bit too stringent, but I didn't realize it until one of my favorite players missed his chance at the HOF. I fixed that and it affected future HOF nominations, etc. Sure, I could have done manual HOF, but I would rather the game handle everything in this scenario. Aside from the few quirks, OOTP is one of the best simulations I've used. 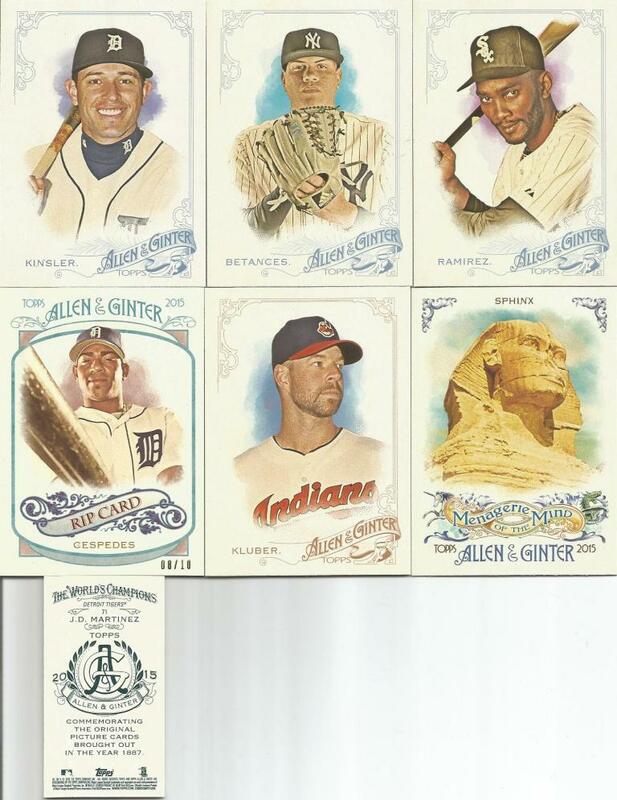 It is why I keep using it each year during my Pack-A-Daily Circus pack breaks. 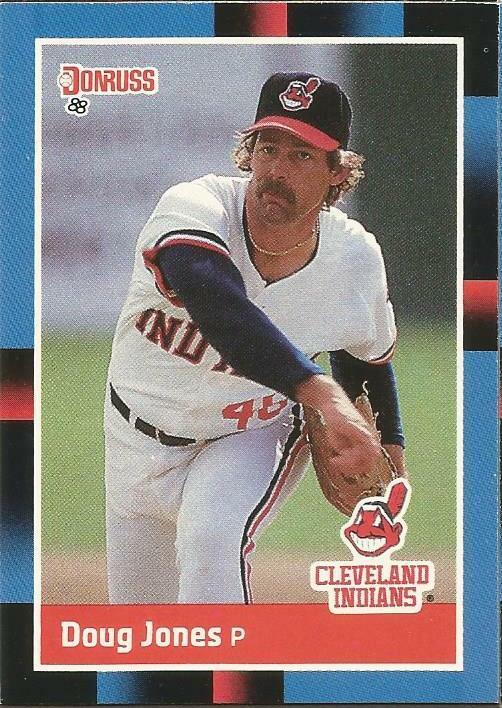 Now, I just need to get off my duff and get my PAD Circus league back in order before the real MLB season ends! #PackADailyCircus - Pack 189 - Draft Results 8/23! Hey everyone! I was a little late running the draft this weekend because I wanted to get the Allen and Ginter cards taken care of beforehand - I know, they aren't related, but in my brain it made sense. In any case, we have the randomized list and the results. The Managers/Players list has been updated as well! Congrats, managers!! Next step is to sort through free agents and get the next draft going - the next is a double-draft, so we will hold TWO drafts at the same time for this coming weekend. Haha, it was so weird not typing "GAC" after each card! But, WOW!! Congrats to CaptKirk42s! Not only did they grab back-to-back players, but then added another for good measure. Congrats to everyone else in here as well. We pulled a ton of free agents, so it looks like anyone getting cards came off lucky. 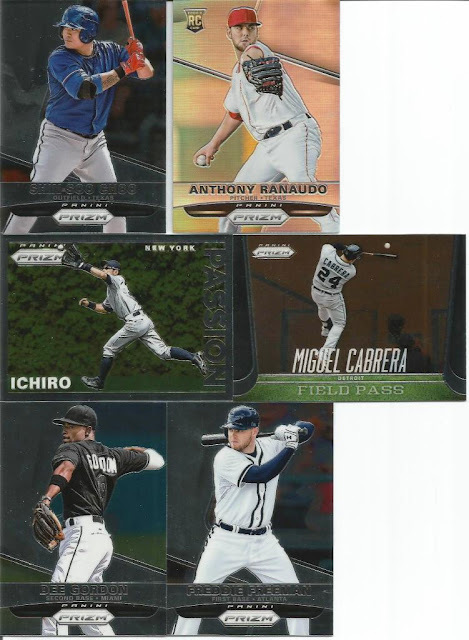 Pedersejs emailed me to say that we should RIP open the Cespedes card to see what's inside. To catch folks up, I am sitting at +149.6 points in the Gint-A-Cuffs contest. We know that I will get at least +10 just for ripping open the card. Congrats to PatP!! Thanks to Pedersejs for letting us rip your card apart to the benefit of others! When I first started, the top score was 159.6, but since then a new leader has emerged with 185.2 at the time of this writing. But, my score ain't bad at all! It puts me in second place thus far. Well, here we are. This is the final post from the first Hobby Box of 2015 Allen and Ginter. We've got six packs left. We start the night off with a GAC score of 125.6 so let's see if we can rally some points. According to the current GAC Leaderboard, we have to beat 159.6... That will be tough. Of course, I could always pull the Rip card for extra points. We'll see. Wow, we managed to get +5 additional points! I even managed to get a player along side several other managers. Williams, an ex-Yankees player defies the scoring rubric, which turns out to be a very good thing for my GAC score! There it is! 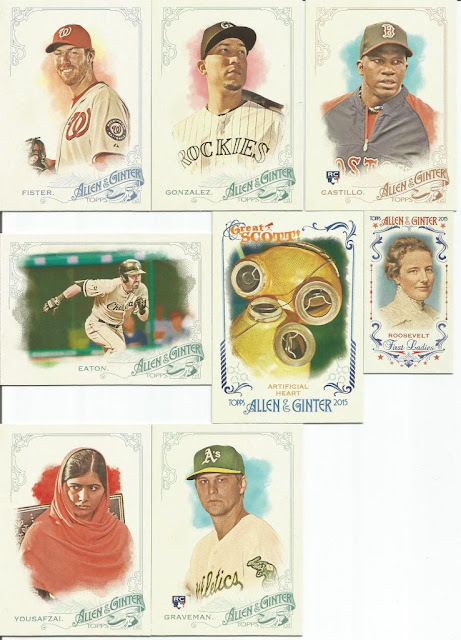 So, the framed buyback was NOT a box hit! We pulled our third hit from the box and it goes to Jennings64. Nice pull! Congrats to everyone else that got a player here, too. We would have had a Perfect Pack if it weren't for the Sling. So close! 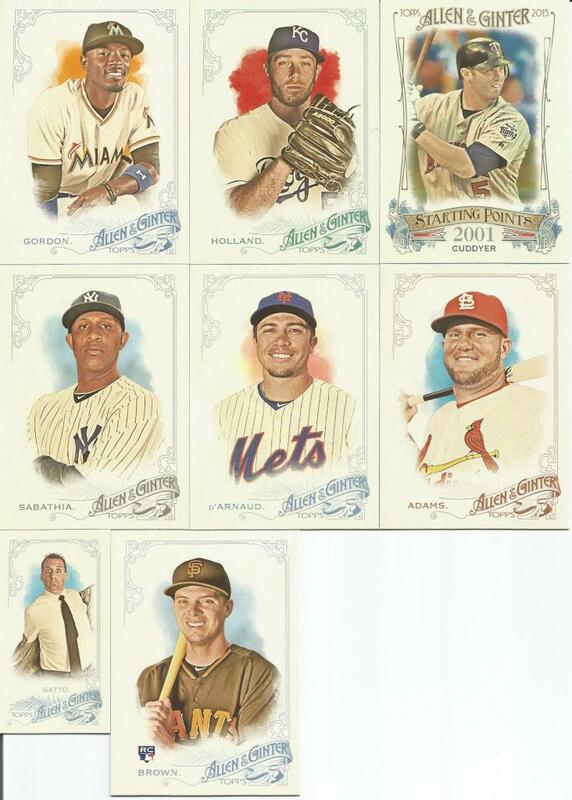 UGH, they sneaked another Yankees player in there on us. That pack netted us a single GAC point. 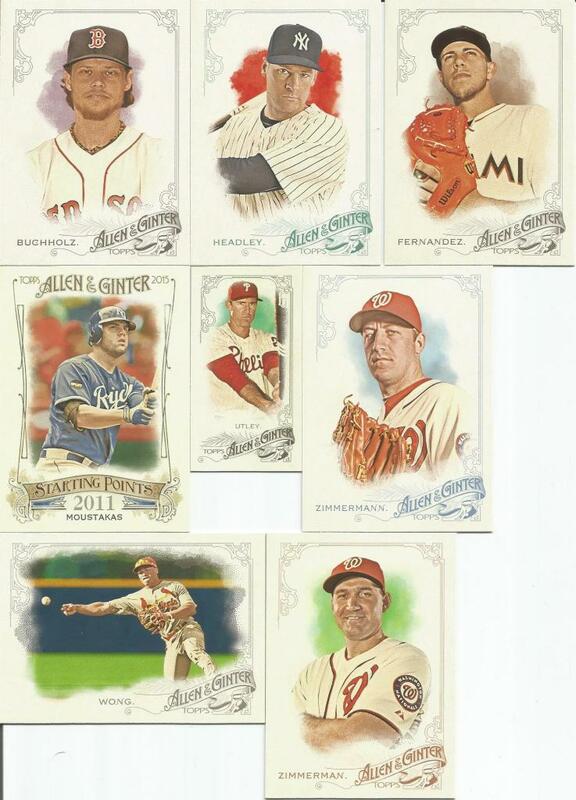 Now that we have found all three box hits, I can't help but wonder if the points are going to come to a trickle. 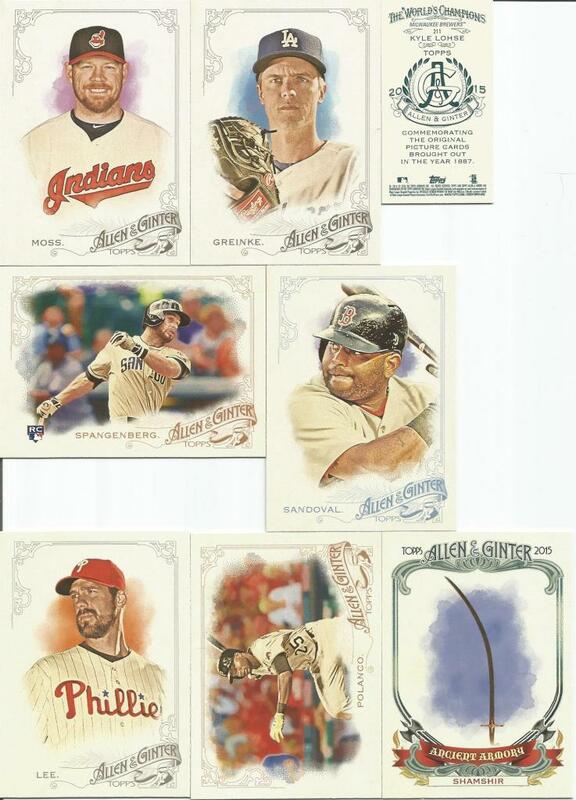 On the upside, congrats to each of you that can add these to your respective stacks! Whew! We managed 2 points, but I was afraid we were get a goose-egg. The gcrls pulled TWO players out of this one. Congrats to them! We have just two packs left. I am 18 points away from the current leader in GAC. 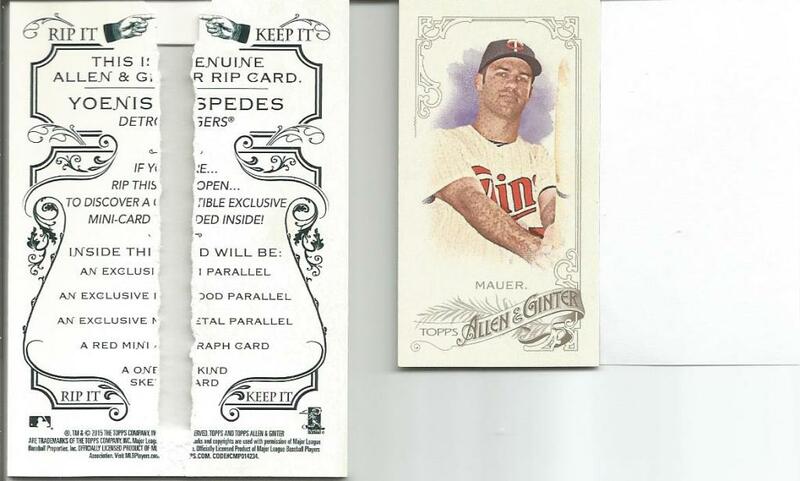 Ripping the card gives me at least +10, which right now is not enough to justify tearing it open. At least, not to me. Well, tartar sauce! Ripping the card would gives us a slight edge over the current leader. We do have a question in the air regarding the red mini pack, so I am waiting to hear from Mark about that. I believe we will wait until I know more about scoring the red minis and then decide from there. Okay, the mini 2011 framed reissue buyback was a little hard for me to figure out, but I got there. I don't know if that counts as a box hit or not. I would think so, since it is framed, but then again, that is not the card type listed as the "One of 3 types..." So.. I dunno. 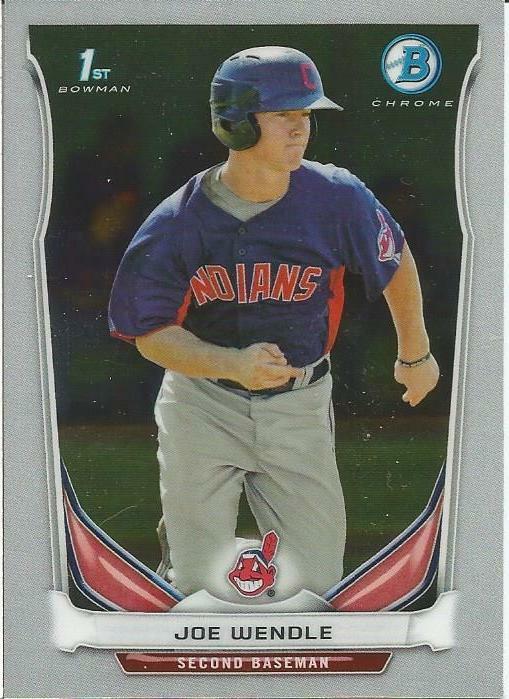 On the other hand, I pulled my GAC favorite player on my favorite team! Wahoo!! Congrats to each of us getting a card from this one! 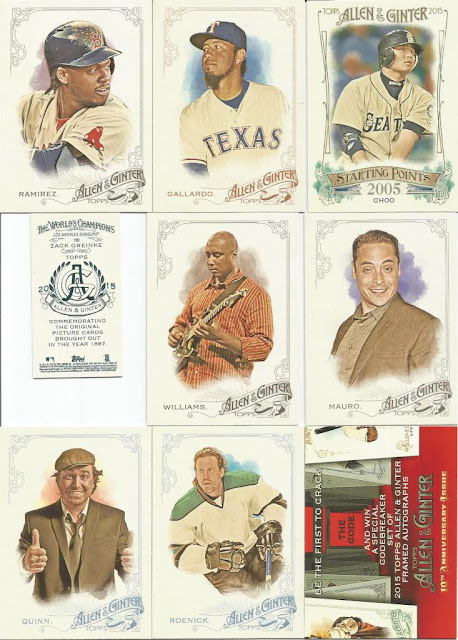 Well, since I'm not sure if the buyback is a hit or not, we'll soldier on some more. 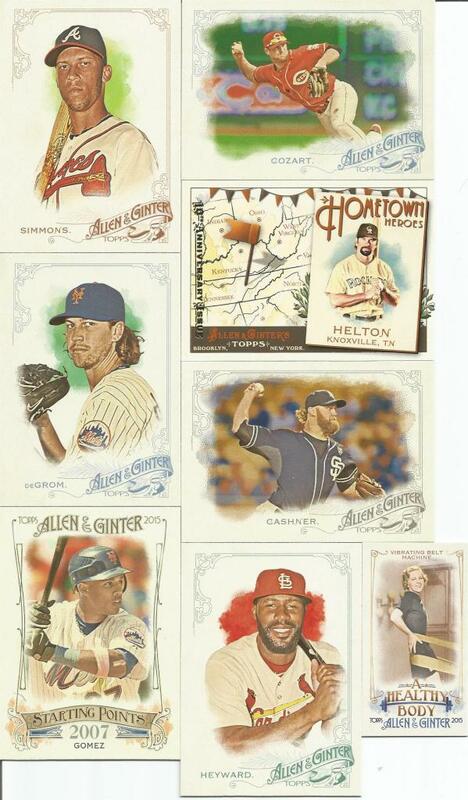 Wow, what a great Helton card! Nice pull for the Quarrys there. The Superchickens managed to pull TWO cards for themselves! Wahoo!! 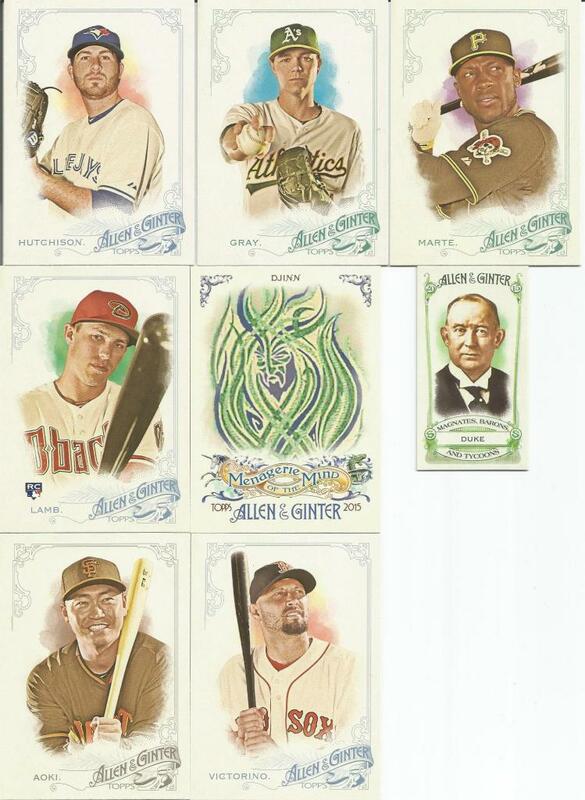 That ended up being a very good GAC pack over all. 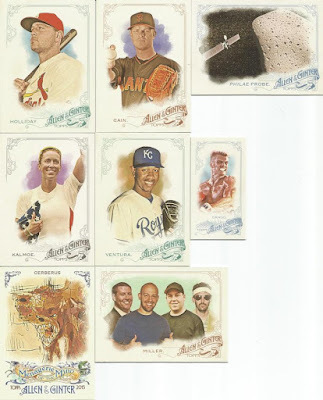 Man, those First Ladies card sure are cool. I know, I said that before. Well, they are. My wife teaches History as part of her 2nd Grade curriculum so I showed it to her. She agreed they are pretty neat. Also pretty neat? 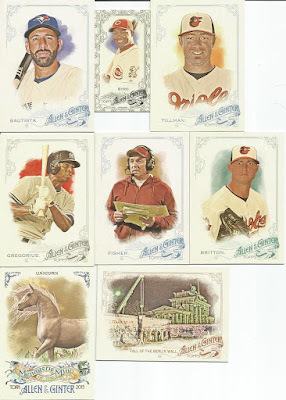 How about a handful of folks getting some more cards for their respective stacks? Congrats, everyone! Congrats, managers! I'm not sure if I remember seeing Alecs All-Stars come up yet in this A&G box break, so that's always a plus to see folks grab a card that we don't see a lot of. I'm not sure if Thoughts and Sox has had one yet either. Well, in any case, I'm glad we could add some cards to everyone's stack that pulled a card here. On the GAC side, we're still adding points to our total! I'll keep going (I probably just jinxed us). Tack on another +4 to the GAC score and add a few more cards to some very familiar names in this break. 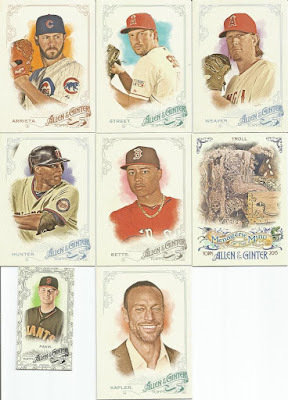 You three are seriously raking it in here with this box in terms of adding cards to your collections. Great drafting! Congratulations to the Maddings and RJBreeze for keeping this pack from being a bust in terms of PAD Circus! UGH, as soon as I saw Fisher, I knew he was a penalty. 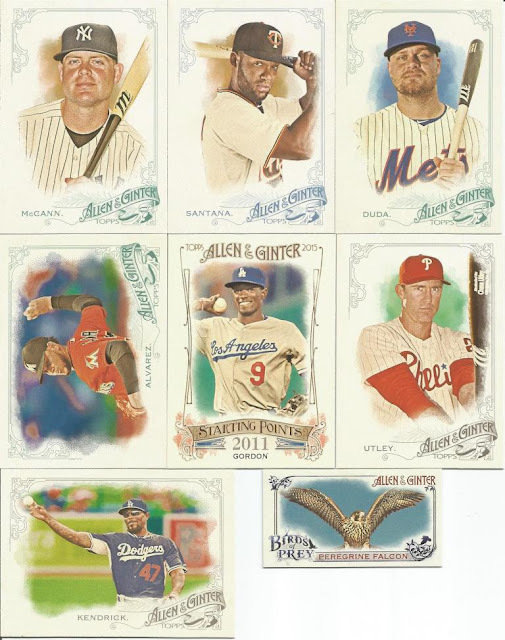 Luckily, I pulled yet another Menagerie of the Mind card (I may have the whole set before we're through, yeesh) and that Byrd Black Border Mini sure helped, but then we get smacked with a Yankees card. Three steps forward, two steps back. I have a LONG way to go to get Top Three on the GAC leaderboard. Okay, let's stop here. That's a whopping SEVEN packs in one post. haha, I didn't even realize it until just now! I was just rolling along... Next post, we'll wrap up the box! Wow, that First Ladies card is looks great with all the red, white and blue! Congrats to those of you able to grab cards from this one. We pulled quite a few free agents. Holy, freaking cow! Erin scored big time here - and so did I! 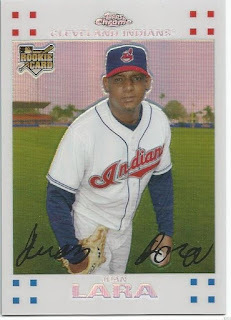 Not only did I pull a relic (+6), but Molina is on the Favorite Player list (+2) so I get the 1.7x multiplier bonus! Wahoo!! 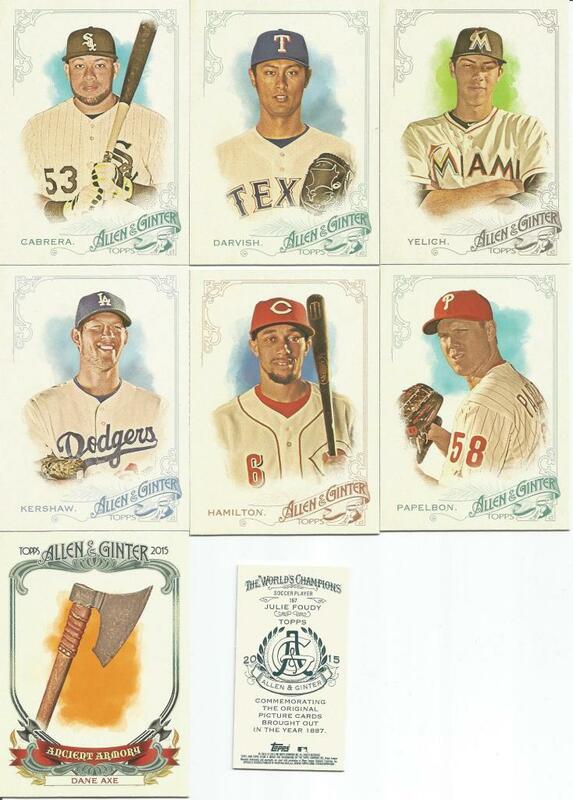 On top of that, we pulled a Posey A&G backed mini and Ancient Armory. 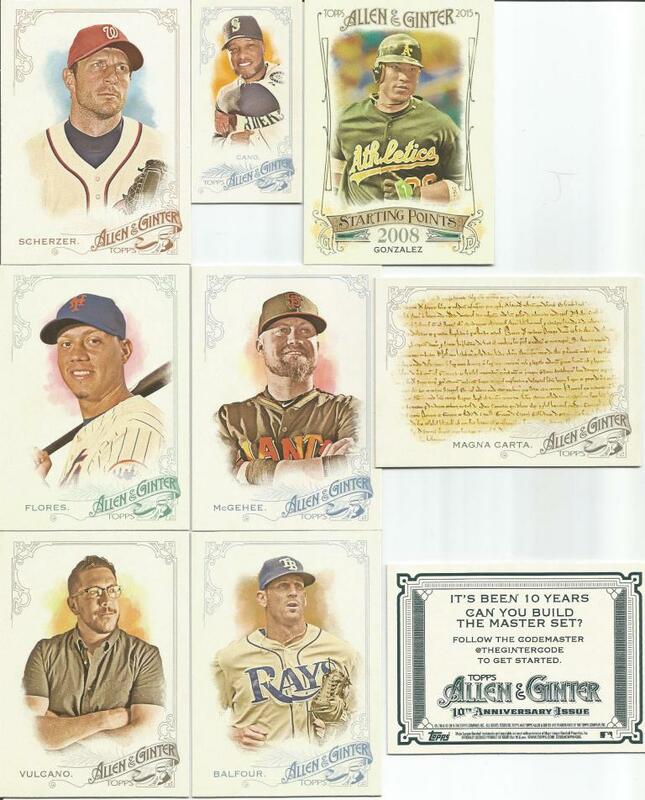 What a great pack for my GAC score! 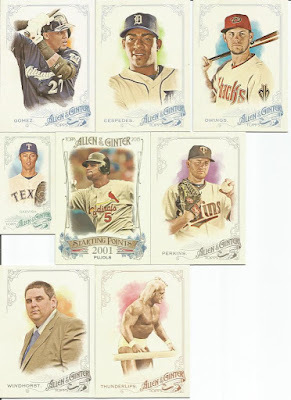 That also means we have pulled 2 of the 3 per-box hits. Wahoo!! A Perfect Pack!! 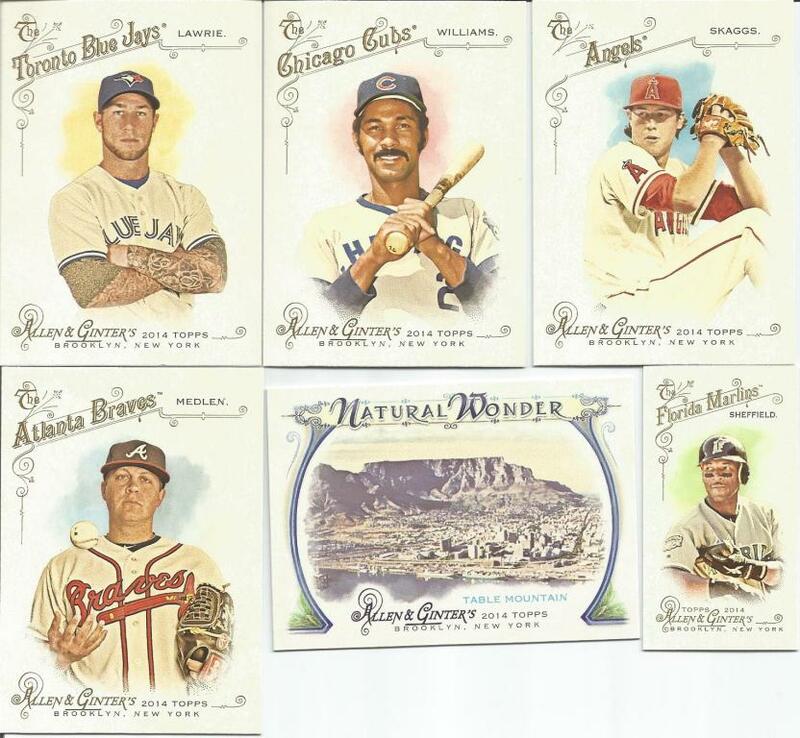 Congrats to CaptKirk42s for grabbing two players and to everyone else that snagged cards to make this perfect! Headley knocked us back a point in the GAC score, but Moustakas helped push us ever-so-slightly forward. Good afternoon, or evening, or morning, depending on where you are and when you are as you read this. 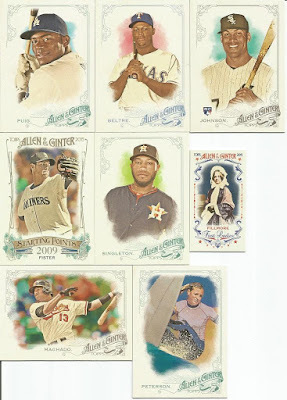 I am going to open packs of 2015 A&G until we hit some kind of mojo, so let's get ripping! Congratulations managers! 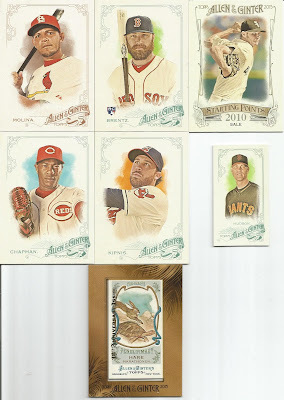 On top of the cards pulled that are already claimed, we snagged two cards for GAC that added four points to our total. We're going to need a lot more, though. Nice job! Several of you added cards to your stacks while we added some free agents to the mix. That makes for an almost even blend... Like I'm talking about coffee or something. Well, shoot! 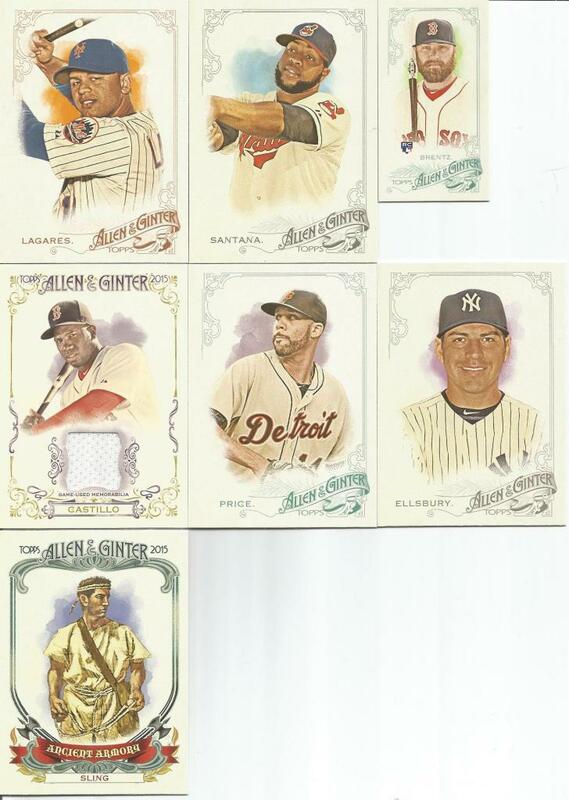 We pulled another Yankee... But, we pulled an insert, a mini A&G back, plus a freakin RIP CARD!! I seriously did not expect to get a rip card, so... I have to figure out what I'm going to do with that. For the integrity of cards going to managers, I'd rather keep the card in tact. In terms of boosting my GAC score... I'd have to rip it. The dilemma has come upon us, or me, or something.